Background and objectives: Cardiovascular disease (CVD) is the largest contributor to all-cause mortality in patients with end stage renal disease (ESRD). Accelerated vascular calcification is a key risk factor for CVD in these patients. The etiology of vascular calcification and the specific role calcium supplementation may play in accelerating calcification have not been fully elucidated. Design, setting, participants, & measurements: We summarize published data that report on the association between calcium supplementation, vascular calcification, and CVD in patients with and without ESRD. Results: The majority of randomized, controlled trials in patients with ESRD suggest that calcium supplementation—in the form of calcium-based phosphate binders—leads to a progression of vascular calcification. However, studies showing that calcium-based phosphate binders increase cardiovascular mortality are lacking in patients with ESRD. In contrast, one randomized trial in healthy postmenopausal women reported that, compared with those not receiving calcium supplementation, women who take supplements are at an increased risk for cardiovascular events. Conclusions: Given the potential for harm with calcium supplementation in healthy postmenopausal women and the evidence that calcium-based phosphate binders are associated with adverse intermediate outcomes in patients with ESRD, calcium—either as a phosphate binder or as a supplement—should be prescribed with caution. Over one half of all deaths in patients with end stage renal disease (ESRD) are caused by cardiovascular disease (CVD) and stroke (1). Patients with chronic kidney disease (CKD) develop atherosclerotic vascular disease earlier and faster than the general population (2), and mortality is ∼10 to 30 times higher in dialysis patients (3). A key risk factor for CVD in patients with ESRD is vascular calcification (4). Patients with ESRD typically develop medial calcification, which contributes to excess cardiovascular (CV) risk by increasing arterial stiffness. The development of vascular calcification is not a passive deposition of calcium phosphate crystals but rather a well-organized, active process involving specific cellular activity and protein synthesis, similar to skeletal bone remodeling (5–8). A simplified model of the vascular calcification process is illustrated herein (Figure 1) (9). Simplified model of the vascular calcification process illustrates osteoblastic differentiation of vascular smooth muscle cells to calcifying vascular cells. The process is regulated by a number of inhibitors (e.g., osteopontin and osteoprotegerin) and activators (e.g., phosphorus, bone morphogenetic protein-2). Adapted from Ref. (9). 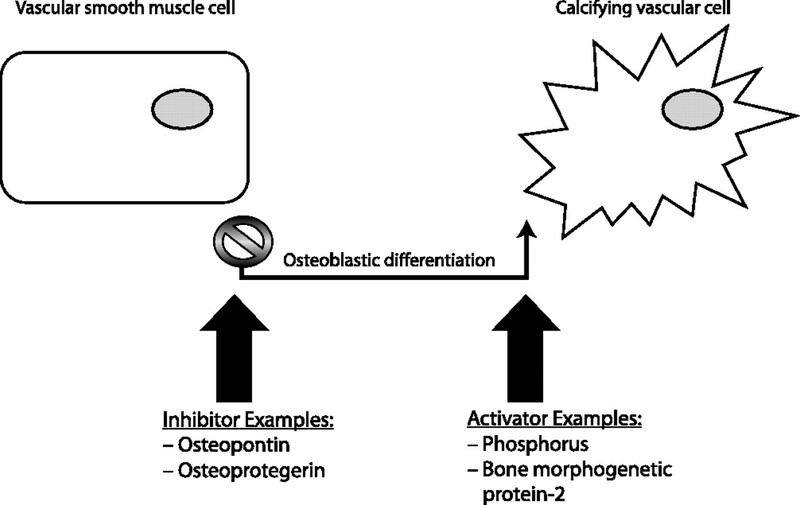 Although all factors regulating vascular calcification have yet to be identified, it is well accepted that a critical first step involves transformation of vascular smooth muscle cells to osteoblast-like cells (8). Several substances may facilitate this transformation, including elevated levels of serum phosphorus (10,11) and calcium (7,10). This raises the clinical concern that calcium, typically prescribed to patients with ESRD as a phosphate binder, may accelerate arterial calcification, arterial stiffening, and ultimately may contribute to increased mortality. This review summarizes the published studies that report on the relationship between calcium and CVD outcomes in patients with and without ESRD. The aim is to provide the practicing nephrologist with clinical guidance when choosing a binder for the purposes of binding phosphate and/or maintaining bone health in patients with ESRD. Hyperphosphatemia does not occur in healthy men and women. In contrast, elevated serum phosphate occurs early in CKD and ubiquitously in patients with ESRD. Retrospective and cross-sectional studies have consistently shown a strong linear relationship between increasing serum phosphate and mortality (12–15). For example, some studies report that, for every 1-mg/dl increase in serum phosphorus above the normal reference range, there is an increase in mortality of 5 to 8% (12–15). The explanation for this association is not known but may include the development of secondary hyperparathyroidism, soft tissue calcification, and vascular calcification caused by a direct calcifying effect of phosphate on the vascular smooth muscle cell (11). The correlation between serum phosphorus and adverse outcomes prompted the Kidney Disease: Improving Global Outcomes in 2009 to recommend that serum phosphorus should be maintained within the normal laboratory range in CKD stages 3, 4, and 5, and in patients on dialysis, recommend that elevated serum phosphorus levels be lowered toward the normal range (16). Mechanisms to reduce phosphate include lowering dietary phosphate intake, use of phosphate binders, and, in CKD stage 5, increase frequency of dialysis. It is important to note that these recommendations have been made despite the fact that, to date, studies performed in dialysis patients showing a reduction in morbidity or mortality by lowering serum phosphate levels are lacking. In healthy men and women, serum calcium is maintained by calcium absorption through the intestinal tract, excretion by the kidney, and calcium release from or deposition into the bone. Parathyroid hormone is the key regulator of serum calcium and can act through a variety of mechanisms (i.e., stimulating bone resorption or distal tubular calcium reabsorption in the kidney and activating renal hydroxylation of serum 25-hydroxyvitamin D to 1,25-hydroxyvitamin D) to maintain serum calcium levels within the normal range. There are no biochemical measurements that reflect calcium nutritional status in otherwise healthy subjects or those with kidney disease. Surprisingly, this is even true of serum calcium levels, and as such, measurement of serum calcium is not a good surrogate for overall calcium balance (17). Indeed, in healthy subjects, the most commonly used indirect measure of calcium adequacy is skeletal health assessed by bone mass measurements and fracture rates. On the basis of these indirect bone measures, the Institute of Medicine Dietary Reference Intakes Food and Nutrition Board (18) has recommended adequate and upper intake levels of calcium in various age groups of healthy subjects (Table 1). Patients with CKD have several physiologic disruptions specific to the level of renal impairment that alters calcium balance. Furthermore, assessing calcium adequacy in these patients is complex, because decreases in bone mass and fracture rates are confounded by altered rates of bone turnover. Altered bone turnover occurs early in the course of CKD and may be associated with changes in bone mineral density and fracture independent of serum calcium. Prescribing calcium to patients with CKD is equally difficult; because of alterations in mineral metabolism in these patients, the recommendations for calcium intake in healthy men and women cannot be directly applied to patients with CKD. However, most estimates concerning daily calcium intake in patients with CKD are largely based on calcium balance studies in healthy men and women, with an adjustment for decreased urinary losses with worsening renal function. Such data suggest a maximum calcium intake of ∼2.0 g/d (from binders and diet) in patients with ESRD (19). Physicians should consider three factors before prescribing calcium or calcium-based binders to their patients with CKD. First, it is important to remember that calcium-based phosphate binders are a substantial source of elemental calcium that should be considered when assessing daily calcium intake (Table 2). Second, hypocalcemia (as measured by ionized calcium) among patients with stages 3 and 4 CKD is very uncommon. Elevations in parathyroid hormone observed in these patients are typically caused by an elevated serum phosphorus and not a low serum calcium, so prescribing calcium supplements in these patients has no clinical utility. Even in patients with ESRD, hypocalcemia is uncommon, and, if present, is typically related to decreases in 1,25-hydroxyvitamin D that should be directly treated. Third, there are no data to support a beneficial effect of calcium supplementation in patients with CKD. Indeed, excess calcium supplementation may cause harm in the short term by resulting in calcium accumulation and/or hypercalcemia (particularly among those taking vitamin D) and in the long term by possibly promoting vascular calcification. Clinical trials reporting on the use of calcium in patients with ESRD have typically compared the effects of calcium- and non–calcium-based phosphate binders on surrogate outcomes such as serum phosphate, serum calcium, and vascular calcification. Only a few studies have reported on mortality rates, and these were limited by small numbers, short follow-up, and large numbers of dropouts. Because of these methodological limitations, we cannot make a definitive conclusion about the ideal phosphate binder (calcium- or non–calcium-based) in patients with ESRD. Among patients with CKD, there are no data showing that giving calcium, either as a binder or supplement, reduces risk of osteoporotic fracture. The lack of benefit of calcium supplementation together with the potential for harm highlights the fact that calcium should be used with caution in patients with ESRD. The existing data are summarized below and in Table 3. Several randomized, controlled trials have reported on the effects of calcium- and non–calcium-based binders on arterial calcification, primarily in patients with ESRD. In general, these studies suggest that use of calcium-based phosphate binders is associated with greater vascular calcification than non–calcium-based binders. One of the first studies to compare calcium (acetate or carbonate) and non–calcium-based binders (sevelamer) was a randomized trial in 200 hemodialysis patients (20). After 12 mo, the median calcium score in the coronary arteries and aorta increased in the calcium group compared with the sevelamer group (coronary artery score 36.6 versus 0; aorta calcium score 75.1 versus 0, respectively). These data suggest that, when choosing an agent for lowering phosphate, non–calcium-based binders may be superior (20). Most (20–23), but not all (24,25), trials have reported similar findings (Table 3). Two “negative” studies reported no difference in progression of arterial calcification with calcium and non–calcium-based binders. Both studies had a high dropout rate, which may have limited the ability to show superiority of one agent over another. Moreover, in the study of Barreto et al. (24), despite similar rates of progression of arterial calcification in both groups, there were five CV-related deaths over 12 mo of follow-up in the calcium-based binder group compared with one in the sevelamer group. Although the small numbers limit our ability to draw definitive conclusions, these findings, together with the consistent observation that arterial progression is greater among those treated with calcium-based compared with non–calcium-based agents, highlights the fact that calcium-based binders should be used with caution. It has been suggested that the reduction in vascular calcification associated with sevelamer may be caused by its effects on cholesterol. To better understand the mechanism by which sevelamer may reduce vascular calcification, Qunibi et al. (25) compared the effects of sevelamer and calcium acetate in combination with the statin atorvastatin on the progression of coronary artery calcification (CAC) in 203 hemodialysis patients. LDL levels decreased in both groups, and median increases in CAC scores from baseline to 12 mo were similar (29% with calcium versus 30% with sevelamer; P = 0.9). These data suggest that lowering cholesterol is not a major factor in the prevention of CAC progression. Data on the effects of calcium- and non–calcium-based binders in earlier stages of CKD are limited to a single study involving 90 patients who were followed for 2 yr (26). Subjects were randomized to a low-phosphate diet, low-phosphate diet plus calcium carbonate, or low-phosphate diet plus sevelamer. Progression of CAC was greatest in patients randomized to a low-phosphate diet, followed by the group randomized to a low-phosphate diet plus calcium carbonate. In contrast, patients randomized to the sevelamer arm had a reduction in CAC progression. These findings suggest that a binder should be used to lower serum phosphate and that a non–calcium-based phosphate binder may be the best choice to delay progression of CAC. However, our ability to draw definitive conclusions is limited by the intermediate endpoint, short follow-up, and small sample size in this trial. Only a few studies have reported on the effects of various types of binders on mortality. Block et al. (21) assessed all-cause mortality, a secondary endpoint of a previous randomized trial, in 127 patients on hemodialysis randomized to either calcium-containing phosphate binders or sevelamer. After 18 mo of treatment and a median follow-up of ∼44 mo, mortality was higher in the calcium group (10.6 per 100 patient-years; 95% confidence interval [CI], 6.3 to 14.9) compared with the sevelamer group (5.3 per 100 patient-years; 95% CI, 2.2 to 8.5; P = 0.05), suggesting that worsening arterial calcification may increase mortality. A retrospective cohort study reported on the effects of calcium-based phosphate binders compared with sevelamer on mortality in 1377 veterans on hemodialysis, using the Veterans Health Administration's databases over a 2-yr period (27). Compared with those taking calcium-based binders, use of sevelamer was associated with improved survival (hazard ratio [HR] for death, 0.67; 95% CI, 0.54 to 0.84), consistent with the randomized clinical trial data. However, it is not known if the excess mortality associated with calcium-based binders was caused by an increase in CV mortality. These findings are in contrast to those from the Dialysis Clinical Outcomes Revisited (DCOR) trial (28), which was designed to evaluate the effects of sevelamer or calcium-based binders on all-cause mortality in 2103 hemodialysis patients followed for 12 to 36 mo. In a mean follow-up time of 19 mo, no difference was observed between groups regarding all-cause mortality (HR, 0.93; 95% CI, 0.79 to 1.10) or CV causes of death (HR, 0.93; 95% CI, 0.74 to 1.17). A preplanned secondary analysis of an intent-to-treat comparison of sevelamer and calcium-based phosphate binders stemming from the DCOR trial confirmed previous results: treatment with calcium-based binders versus sevelamer did not affect overall mortality (primary outcome) or CV causes of death (29). However, in a prespecified analysis of subjects ≥65 yr of age, there was a 22% reduction in mortality among those randomized to sevelamer compared with patients who received calcium-based binders. How does the nephrologist apply the above data to clinical practice? A reasonable approach is to consider that elevated serum calcium, elevated serum phosphate, and an elevated calcium-phosphate product lead to increased arterial calcification, which ultimately may contribute to increased mortality. We also know that prescribing a non–calcium-based binder will decrease serum phosphate and not increase serum calcium, theoretically decrease calcium-phosphate product, and not promote arterial calcification. Although a direct link between arterial calcification, calcium-phosphate product, and CV morbidity and mortality has yet to be definitively shown, data from some studies suggested that use of calcium-based binders may be associated with a slight increase in mortality. Thus, while we await further definitive studies, it may be prudent to restrict the use of calcium-based binders to lower phosphate. Few studies have reported on the effects of calcium supplementation without vitamin D (which is considered cardioprotective) in otherwise healthy men and women. A recent trial randomized 1471 postmenopausal women to either calcium supplementation totaling 1 g/d or placebo and assessed adverse CV events over 5 yr, including death, sudden death, angina, myocardial infarction, and stroke (30). Subjects in both groups were not restricted with regard to dietary calcium, and both groups consumed ∼800 mg dietary calcium per day. The reported incidence of the myocardial infarction, stroke, or sudden death composite endpoint was more common in the calcium group than in the placebo group (101 events in 69 women versus 54 events in 42 women; relative risk, 1.47; 95% CI, 0.86 to 1.74). These data suggest that calcium supplementation ≥1800 mg/d may increase the risk of CVD in postmenopausal women. In response to this study, Lappe and Heaney (31) reanalyzed data from their previous trials of 1179 postmenopausal women who were randomized to either double placebo, calcium plus placebo vitamin D, or calcium plus vitamin D. After 4 yr of follow-up, they reported no increase in CV events in either calcium group compared with placebo. However, the dose of calcium was lower (∼1400 mg/d), as was the overall vascular event rate, perhaps because study participants were ∼10 yr younger than those in the study of Bolland et al. (30). Surprisingly, there are no data showing that calcium supplementation without vitamin D prevents fractures. A meta-analysis reported on the effects of calcium supplementation with modest amounts of vitamin D (400 IU/d) and showed that, among women ≥45 yr of age, calcium supplementation prevented decreases in bone mineral density compared with placebo (32). This analysis reported a trend toward fewer spinal fractures among patients supplemented with calcium, but it did not reach statistical significance. The limited benefits of calcium supplementation on bone health, together with the potential of adverse CV events in otherwise healthy women who are prescribed calcium, raises concern about the widespread use of calcium supplementation. As a result, we recommend calcium be prescribed cautiously and only if careful dietary assessment indicates that calcium intake is inadequate. The goal should be a total calcium intake of 1000 to 1200 mg/d. Abnormalities in mineral metabolism are common in patients with CKD, and the most widespread is an elevated serum phosphate level. Not only is elevated serum phosphate an independent risk factor for increased mortality in patients with CKD, but emerging evidence suggests that treatment of hyperphosphatemia with calcium-based binders may also be associated with adverse outcomes. Studies have shown that use of calcium-based binders increases serum calcium, increases calcium-phosphate product, and may accelerate vascular calcification. There are also some data indicating that the use of calcium-based binders may be associated with an increase in mortality. However, it is important to note that the current evidence concerning the relationship between vascular calcification and adverse clinical outcomes does not show that vascular calcification directly causes either mortality or other hard clinical outcomes as evidenced, for example, by the DCOR trial (28). Indeed, there are several other postulated mechanisms that do not involve vascular calcification that may affect mortality in patients with CKD. Several studies have noted other mechanisms that contribute to vascular calcification, including age, diabetes, inflammation, male gender, and time on dialysis (33). As such, we would like to highlight that vascular calcification is not yet a validated surrogate for clinical outcomes in patients with CKD. Considered together, the data suggest that there is a potential for excess calcium, commonly in the form of a binder, to cause harm to patients with CKD or ESRD. As such, the 2009 Kidney Disease: Improving Global Outcomes guidelines recommend that, in patients with CKD and hyperphosphatemia, the dose of calcium-based phosphate binders should be reduced in the presence of persistent or recurrent hypercalcemia (16). Further studies are clearly needed to compare the mortality effects of calcium-based and non–calcium-based binders, but while awaiting these results, it seems prudent to be cautious. This would imply that the use of calcium-based phosphate binders should be carefully monitored and possibly avoided in patients with CKD or ESRD. This work was supported by Genzyme Corporation. Editorial assistance was provided by Larry Rosenberg, PhD, of Envision Scientific Solutions, which was funded by Genzyme Corporation.